Many people who have debt problems often suffer from a bad credit profile as well. It’s a double whammy and definitely something that needs to be taken care of. So, how do you approach the issue? One obvious way to address your credit profile is to pay your bills on time, and when possible, in full. If you have extra cash, use it to pay down any outstanding debt. But not all debts have equal influence on your profile. Depending on your individual circumstances, a high priority may be to pay down debts that will be recognized by several credit profiling factors. Getting rid of credit card debt may give you faster results than paying down other debts, because it is generally a riskier type of unsecured debt. Once you pay off a card, you may see a positive impact to your overall profile. Your credit profile should be important to you, because it has the power to determine a wide range of things in your life. If your credit profile is not as strong as you want it to be and you are looking to make it stronger, it may seem intuitive to pay off all of your debts. However, this strategy may backfire. You should always analyze each debt and predict how making changes to it will affect your overall credit profile. If you choose to settle your debts for less than you owe (a.k.a. use debt resolution), talk to a certified debt specialist to get more information about how this process works. 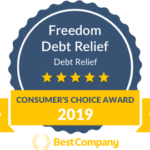 The benefit of debt resolution is that it is often a cheaper and quicker option for resolving debt. It may be especially helpful for people with high debt loads ($10,000+) and are struggling to keep up with their payments. There are multiple ways to deal with debt and credit. If you are unsure which method is best for you, give our team a call at 1(800) 544-7211 and we’ll guide you through your options!